She is 68 years old, and was born in Virginia. Her mother, as far as she knows, is her biological mother. But the man named on her birth certificate is not her biological father. She was adopted by him, and her birth certificate amended to reflect him as her father. Virginia laws don’t allow her unrestricted access to her original birth certificate. She has been fighting cancer, and wants answers, and isn’t sure how much time she has to get them. That was the question that landed in The Legal Genealogist‘s mailbox this week and it’s a good one. First, of course, as with any adoptee, the letter-writer needs to take advantage of every part of the law that even hints at access to information. In her case, in Virginia, there are possible avenues to obtaining her original birth information, and her medical condition may well give her the argument she needs. The Adoptee Rights Law Center website has information about information access in all 50 states, both current laws and proposed legislation that might change those laws. It’s put together by Gregory D. Luce, a Minnesota lawyer who specializes in adoptee rights laws and who is, himself, an adoptee. To get to the details for any state, click on the state on the map on the current laws page, and a box will appear with a brief description of the state’s laws. At the end of the text in the box is a Read More link. Click on that and you’ll be taken to the page for that state. But the letter-writer has gone beyond the paper trail and done what we recommend adoptees do in these cases: she has taken a DNA test.2 But she doesn’t understand what she’s seeing and she doesn’t know where to turn for help. The reality is… there’s so much help that’s out there for adoptees struggling with DNA results. 1. Head over to the International Society of Genetic Genealogy Wiki and its comprehensive page on DNA testing for adoptees.3 It’s got information on everything from websites, to test projects, to blogs and news articles, to videos and tutorials, to mailing lists, Facebook groups and books. 2. 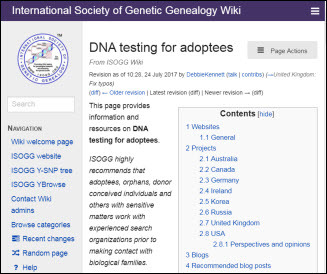 While you’re there at the ISOGG wiki, check out the page on utilizing DNA testing to break through adoption roadblocks.4 Its recommendations — and particularly the links to beginners’ guides to genetic genealogy — are spot on. 4. If you’re on Facebook, do a search there for terms like “adoption DNA” or “adoption and DNA.” You might be surprised at the number of excellent groups on Facebook that can help. DNA Detectives, of course, is a big one — administered by CeCe Moore and others. But there are additional resources including some groups focused on geographic or ethnic regions. In many cases, people skilled in DNA analysis called Search Angels can help guide an adoptee in searching for biological parents. There’s more about Facebook groups for adoptees on that ISOGG wiki page as well. 5. Understand that DNA isn’t a panacea. It can be difficult, time-consuming and won’t always work. And the search doesn’t always pay off: the biological family can’t be found… doesn’t want to be found… or turns out truly not to be worth it when found. Being realistic in expectations from the outset is the only way to go. Great post Judy! You pull key resources together, will help many. Great info shared Judy! I sent the link to an adoptee. Thanks again!